25 Fancy Main Course Dinner Party Recipes from around the web. This collection of dinner party recipes features seafood, poultry, meat, and vegetarian main dishes. Most can be made-ahead, and all are crowd-pleasers. Everyone will want an invitation to your next dinner party! Do you love having guests over for dinner? For me, preparing a special meal for family or friends is a way to bring everyone together around the dinner table and show my love or appreciation for them. But in a selfish way, it’s also an excuse to cook something a little extra fancy than normal. Not like I need an excuse—my blog is all about recipes for special dinners, after all. And as much as my husband appreciates my cooking, I’ll admit it can be fun to show off a little to a new culinary audience. I haven’t met a dinner guest yet who isn’t willing to ooh and ahh over someone’s cooking in exchange for a home-cooked meal. Another advantage to hosting dinner parties: having company over forces us to clean all the junk out of our living room. 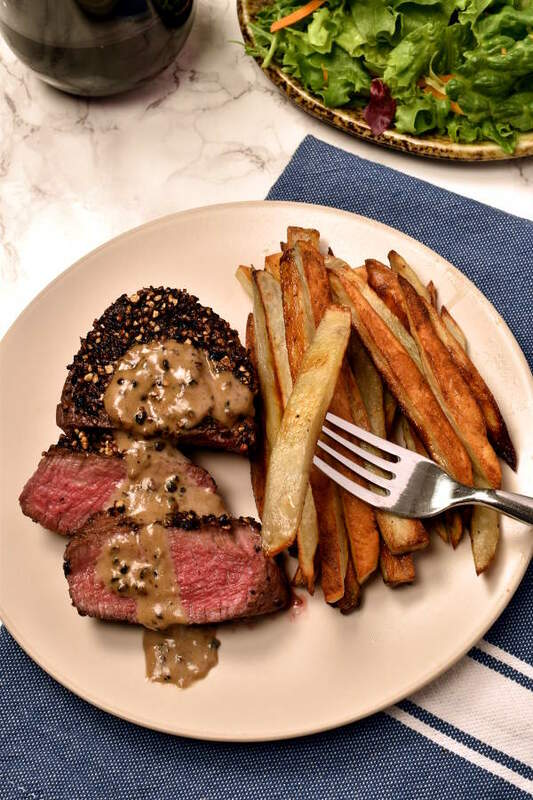 I believe dinner parties are an occasion to cook something extra special and impressive, not a quick 5-ingredient, 30-minute recipe that I might cook on a weeknight. At the same time, as host or hostess, you want to be able to spend time with your guests and not spend the whole night in the kitchen. That’s why I favor recipes that have some make-ahead component. I’ve collected 25 recipes from bloggers around the web that fit both criteria. 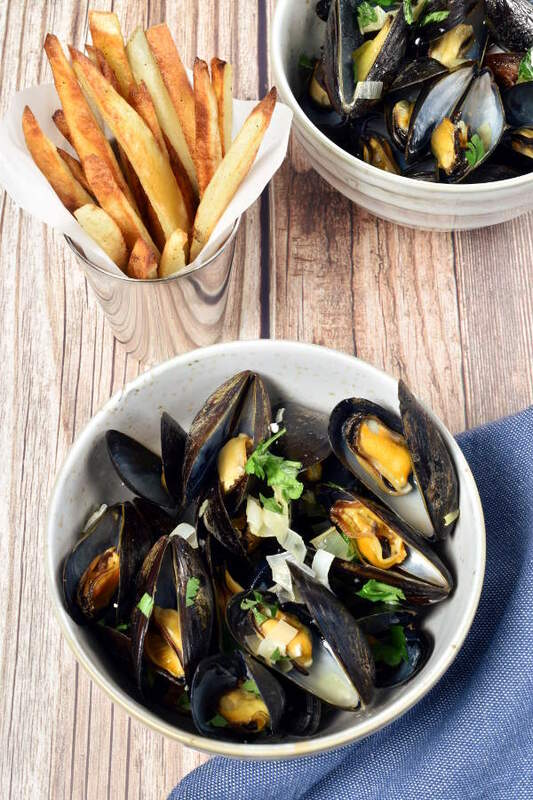 Seafood can be a bit tricky because unlike meat or poultry, you may have to buy it the same day you’re going to cook it. This is especially true for lobster and other live seafood. But if you have the time to shop the morning of your dinner party, these recipes are more than worth the effort. Want people to talk about your next dinner party for months? Maybe even years? 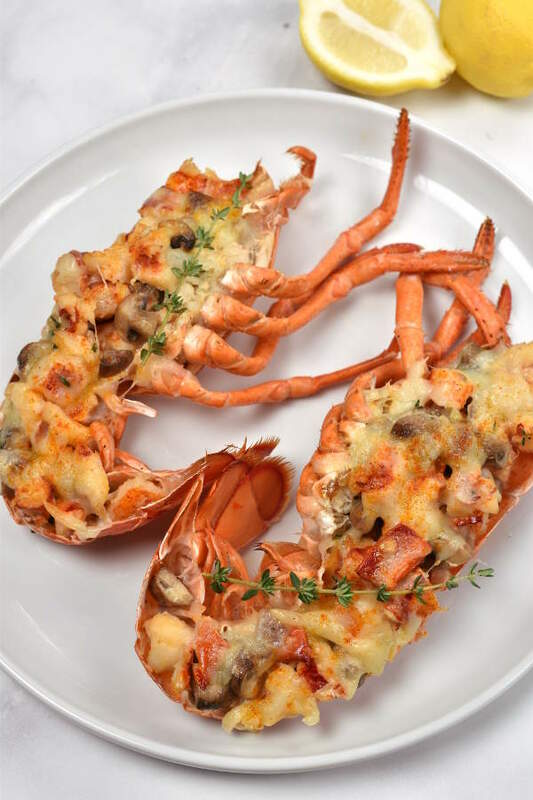 Lobster Thermidor, from my blog, Wednesday Night Cafe, is a French dish made with fresh tender lobster in a cream sauce, baked in lobster shells and topped with gruyere cheese. To make this jaw-dropping dish in advance, I would prepare the lobster shells and filling earlier that day. 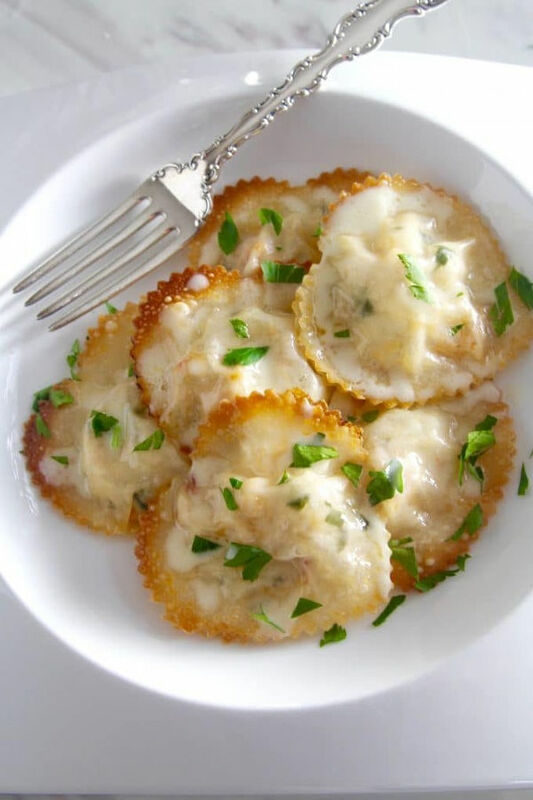 Before serving, gently reheat the filling, stuff the shells, top with cheese, and broil. For dessert, I’d serve these Dark Chocolate Pots de Crème, which you can 100% make in advance. 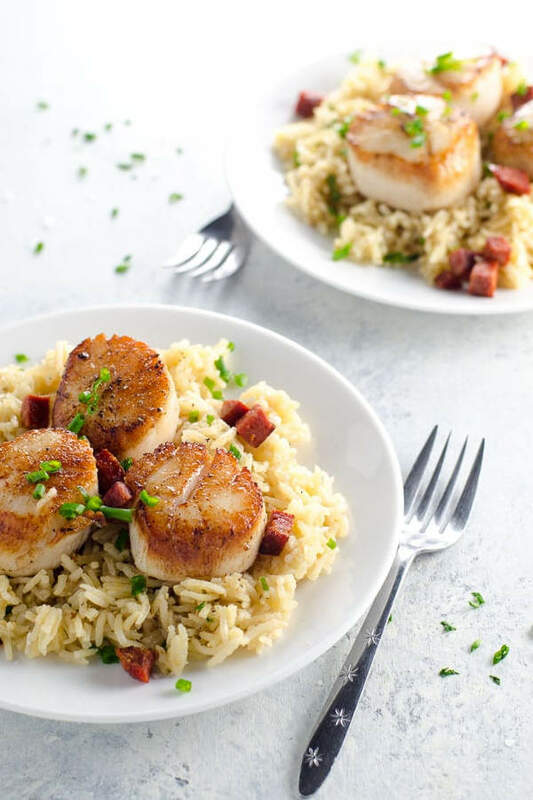 While this scallop recipe from Carolyn at Umami Girl shouldn’t be made in advance, it takes literally 10 minutes to cook. I love how scallop dishes can be so fancy, for so little work. The smoky flavor from Spanish chorizo goes great with sweet briny scallops. It’s like a sophisticated version of bacon-wrapped scallops, and you get to enjoy it as the main dish, not just an appetizer! 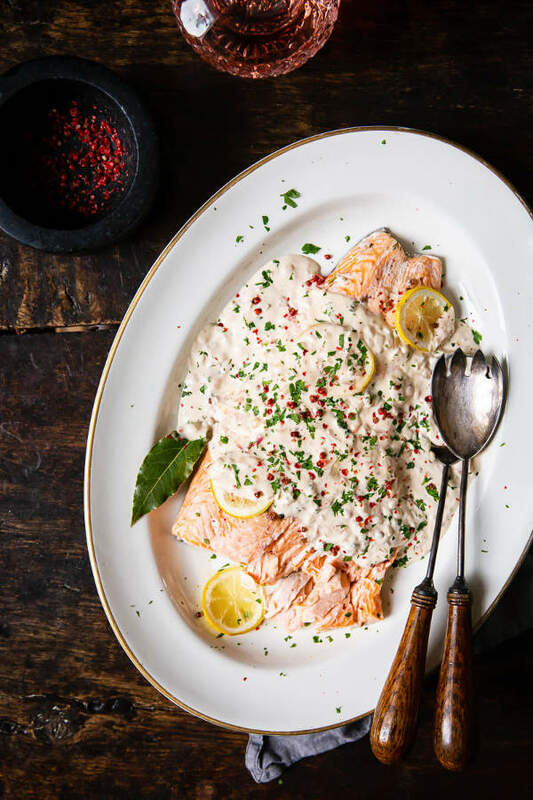 Baked salmon can be bland diet food, or it can be a luxuriously rich showstopping dinner, like this salmon in rose cream sauce from Julia at Vikalinka. I love the added touch of pink peppercorns in the sauce. I would probably prepare the salmon up until baking before guests arrive, then bake during a salad course. Homemade pasta can be daunting, but this recipe from Lisa at Delicious Table makes it easy. The recipes uses wonton wrappers, and the ravioli are baked, not boiled. The lemon butter cream sauce is just made for lobster, and the heart-shaped ravioli cutter is too cute! I would prepare the ravioli in advance and then bake and make the sauce right before serving. 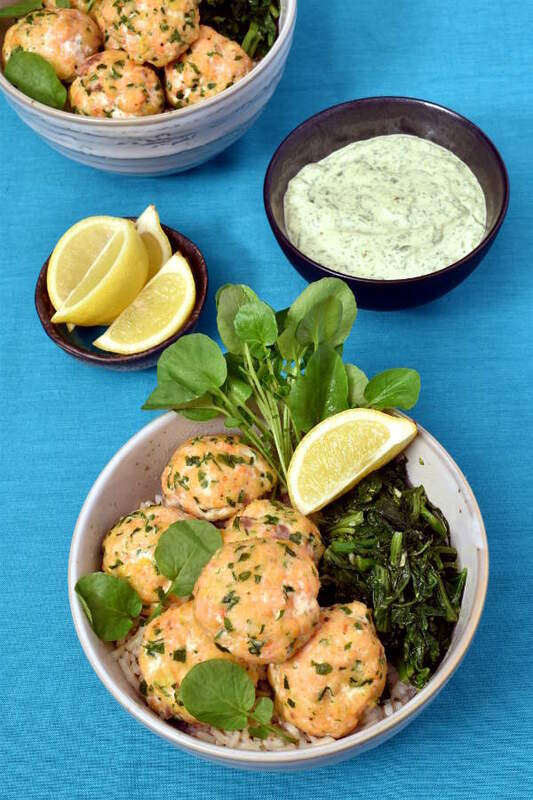 Matthew at Nomageddon brings us this elegant salmon recipe. 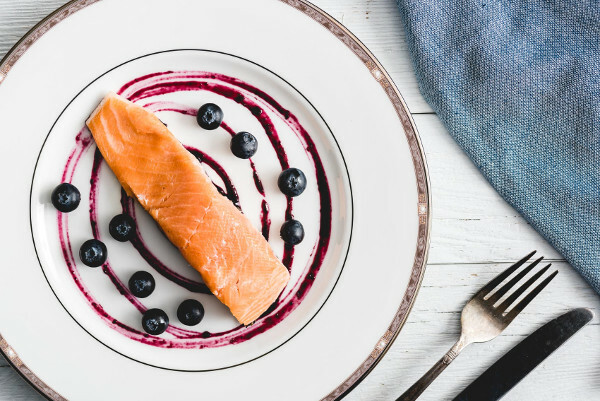 I always like recipes that incorporate fruit into savory main dishes, and the blueberry jalapeno sauce gives everyday salmon a special touch. You can prepare the sous vide salmon in advance and then sear right before serving. 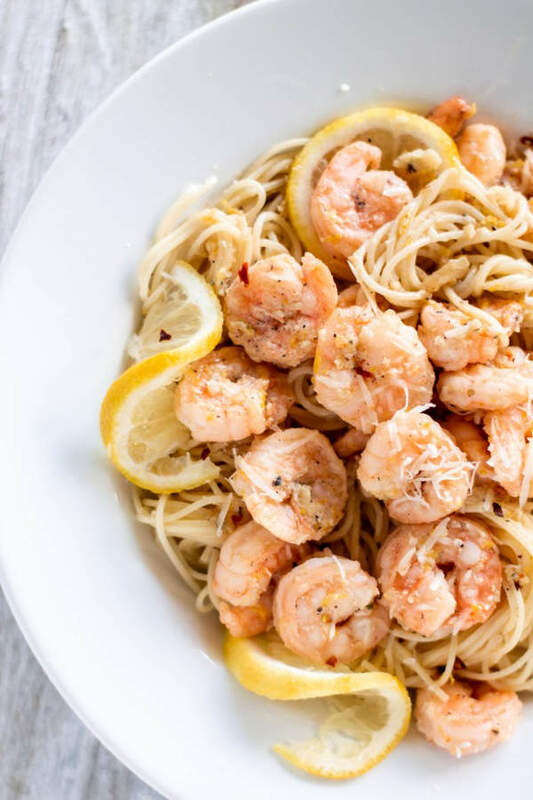 This buttery garlicky shrimp scampi recipe from Eden at Sweet Tea & Thyme takes only 15 minutes to cook. Eden’s recipe is chock full of tips to help even a more novice chef prepare this dish with ease. I’m thinking Caesar salad and garlic bread, and for guests who ask what to bring – a dry white wine. I know I already included a scallop recipe in this round-up, but I love scallops too much to choose only one. 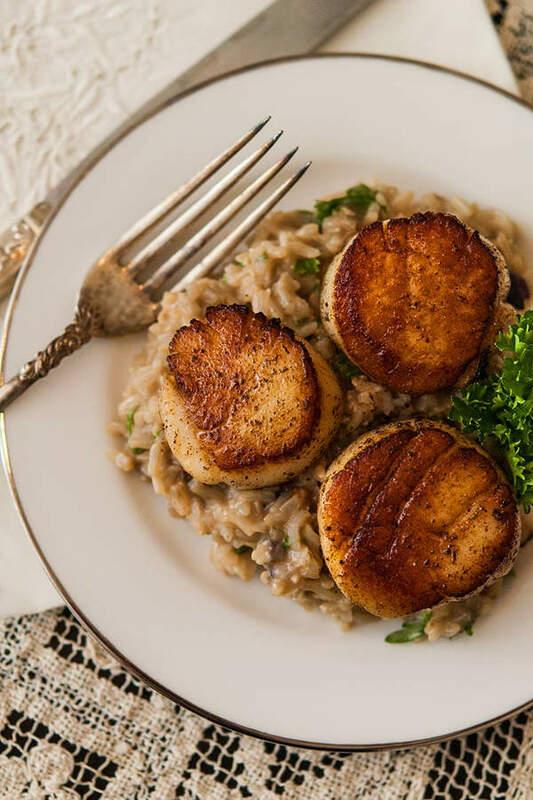 This recipe, from Genevieve at She Keeps a Lovely Home pairs scallops seared in sage butter with a rich and creamy basmati rice made with brie and roasted garlic. You can prepare the rice in advance and just cook the scallops right before serving. There are appetizer and dessert suggestions with this recipe too. I’m guilty of this tendency to not order chicken at restaurants and not serve chicken to guests because it’s something we eat so frequently. I sort of think of chicken as mundane or boring. But chicken dinner party recipes can be just as fancy and special as seafood or meat dishes, as these recipes show. 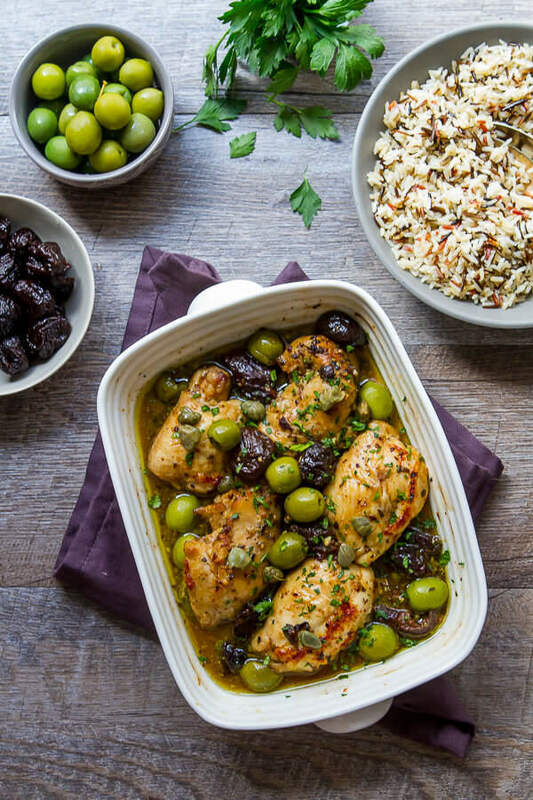 With sweet and salty flavors from prunes and olives, this dish from Nancy at A Communal Table brings baked chicken to a new level. Prep the day before to let the chicken marinate overnight, then pop it in the oven while you sip cocktails with your guests. You guys know how much I like duck – I already have two duck breast recipes on my blog. 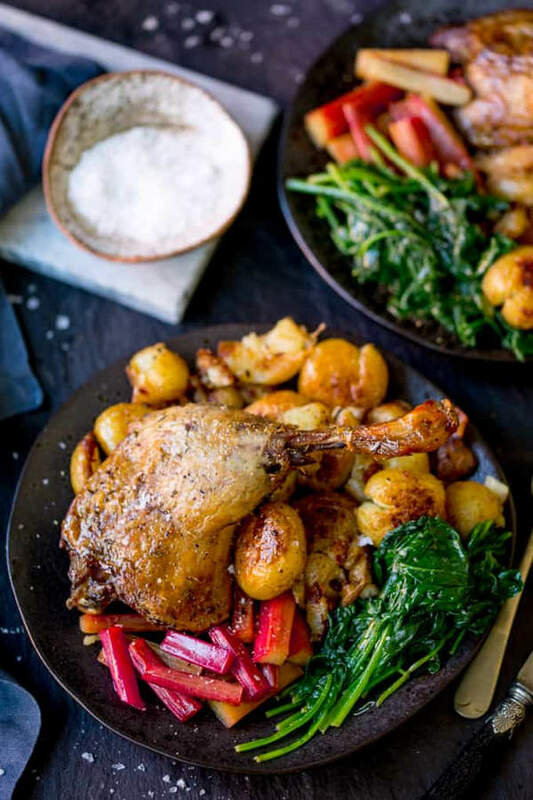 This recipe for duck legs confit from Nicky at Kitchen Sanctuary caught my attention right away. I love the colors on the plate from the roasted rhubarb, and the duck skin looks so crispy. Even better, much of the prep can be done in advance. My mouth is watering just looking at this family recipe from Bethany at A Simple Palate. 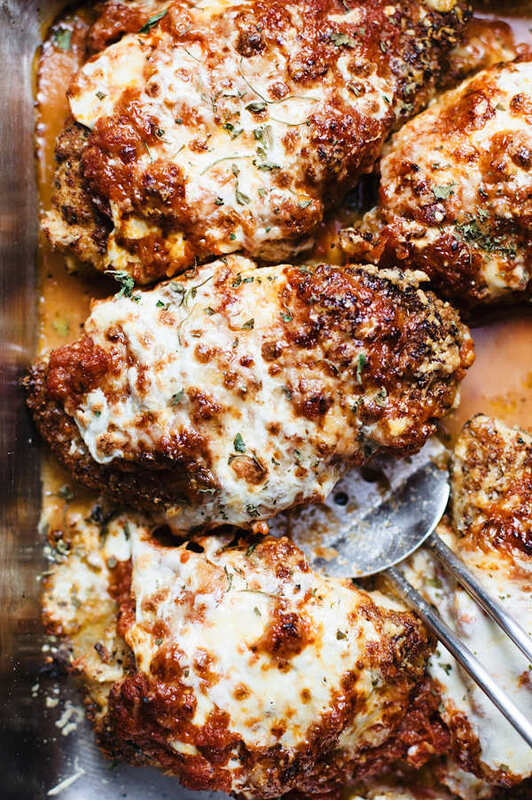 You can’t go wrong with classic Chicken Parmesan, and this recipe has lots of step-by-step photos and tips. I’d stop by our neighborhood Italian bakery for some cannoli or tiramisu for dessert. 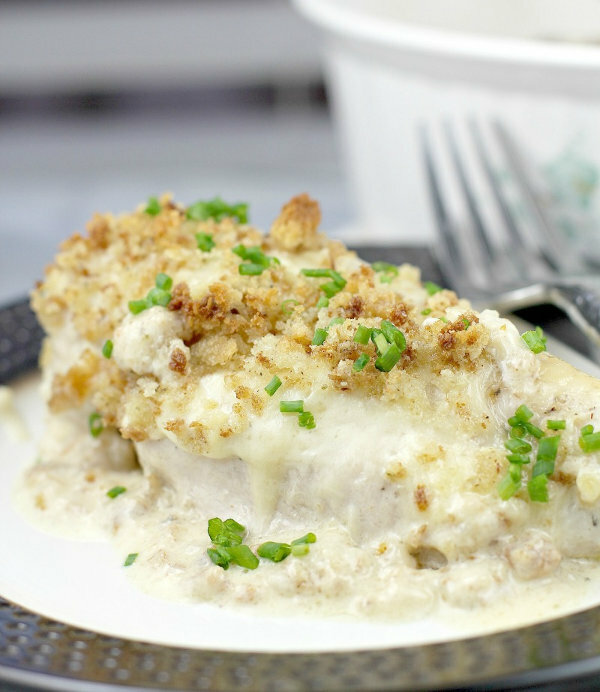 Erica at Erica’s Recipes brings us this creamy cheesy baked chicken recipe, made from scratch without any canned soup or jarred sauce. I would prepare this in advance up until baking and then bake while having appetizers and drinks with guests. And you just know I’d have to bring out some Toblerone for dessert. 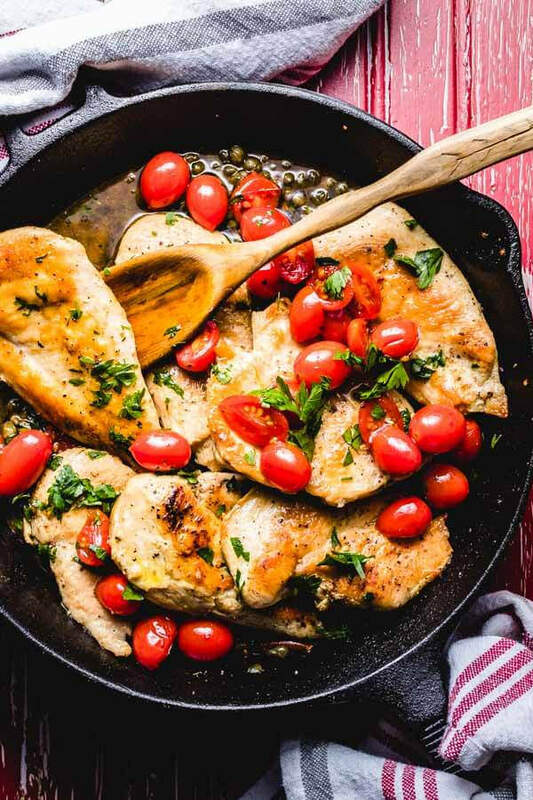 James at Sip and Feast writes that he’s scaled up this recipe to use 10 pounds of chicken when cooking for a crowd, and it’s easy to see why. 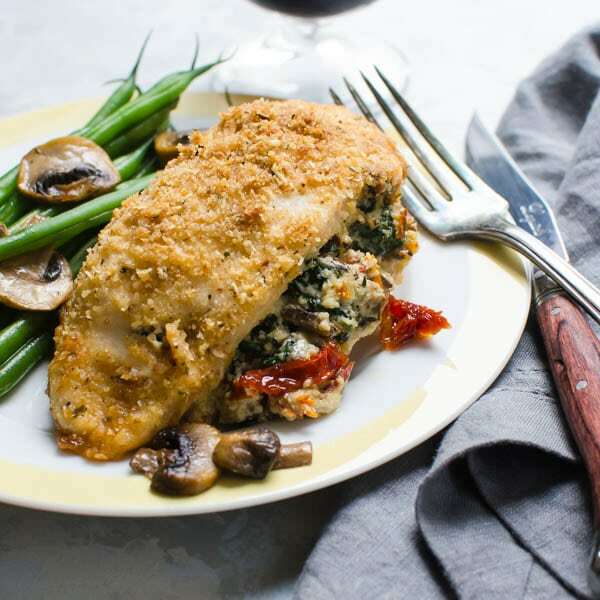 This versatile chicken recipe would be delicious over pasta or rice, and that sauce is just begging for some crusty bread. I love how this dish packs in flavor with simple, easy-to-find ingredients. Sip and Feast also has a lot of drink recipes if you’re looking for some cocktails to serve before dinner. A stuffing is a great way to upgrade boneless skinless chicken breasts. This recipe from Lisa at Garlic & Zest uses ricotta and parmesan cheese, mushrooms, sun-dried tomatoes, garlic, and thyme to up the flavor ante. The buttery breadcrumb coating is the icing on the cake. I would probably prep the chicken in advance and get it into the oven just before sitting down for a salad course. Beef, pork, lamb, and veal are all great choices for a dinner party. Richer than chicken or fish, these meats add a feeling of luxury to any dinner. Whether it’s grilling in the summer or braising in the winter, you have lots of year-round options with meat. I love the mix of sweet and salty flavors in this dish from Courtney at NeighborFood. 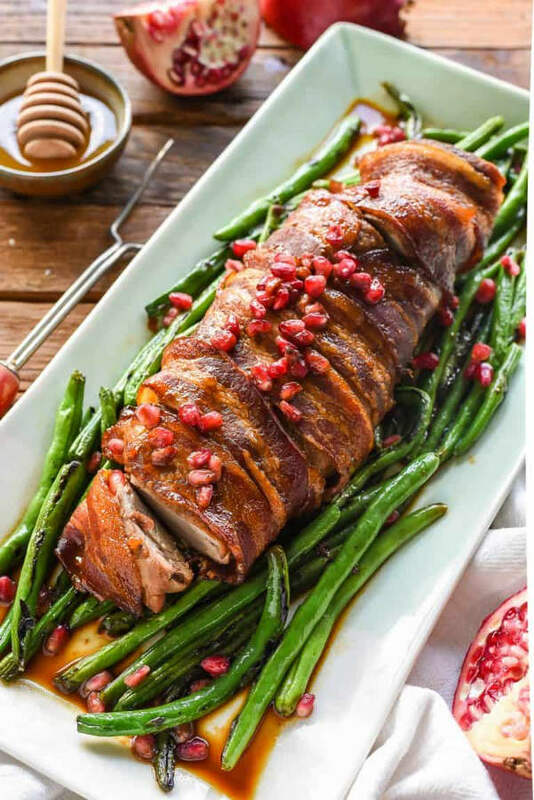 I would prepare the pork tenderloin up until baking in advance and then roast in the oven while you and guests enjoy your starters. This post includes an entire menu for fall or winter entertaining that’s focused on simple, flavorful recipes. 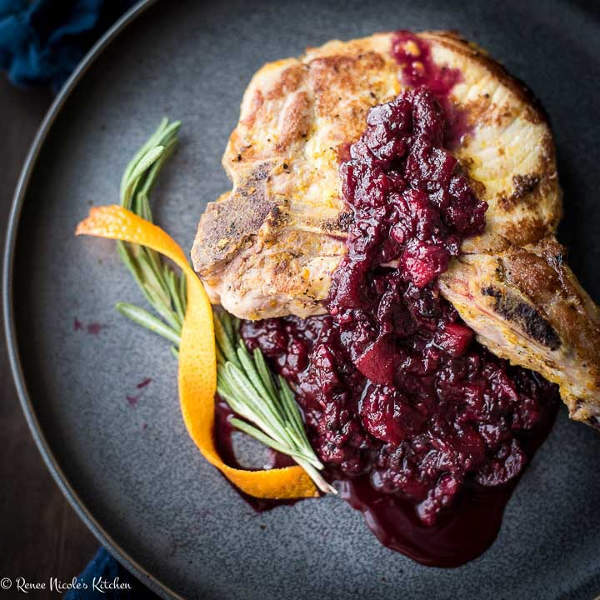 These veal cutlets from Shelby at Grumpy’s Honeybunch are gourmet comfort food at its finest. The creamy dijon sauce and crispy fried shallots add that extra wow factor. 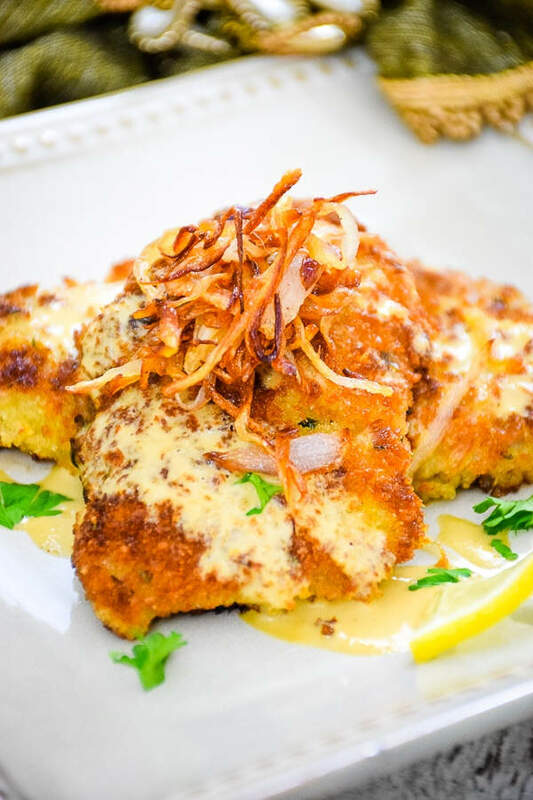 You can prep the veal cutlets in advance and then fry right before serving. 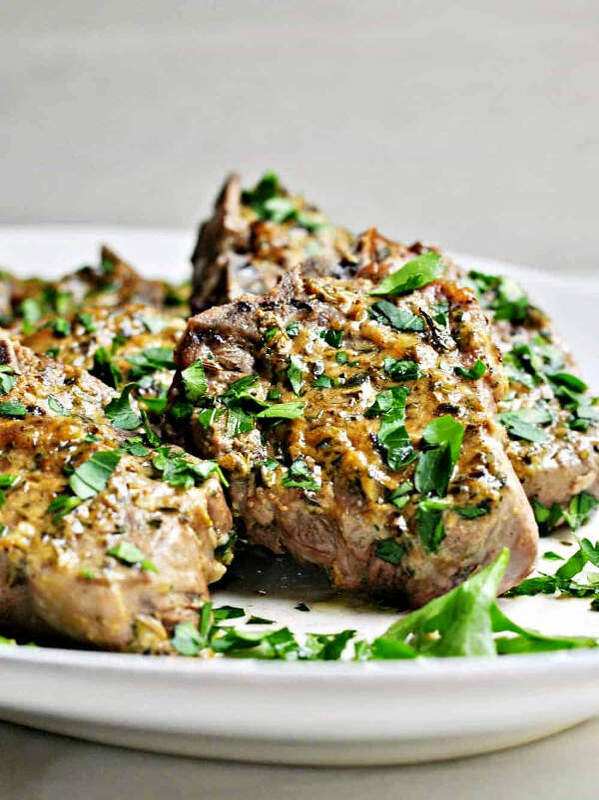 Most people don’t cook lamb at home very often, which makes these roasted lamb chops from Marissa at Pinch and Swirl a real treat for your dinner guests. The mustard and herb paste is key to the recipe’s flavor. Prep the lamb in advance and bake while you eat your first course. 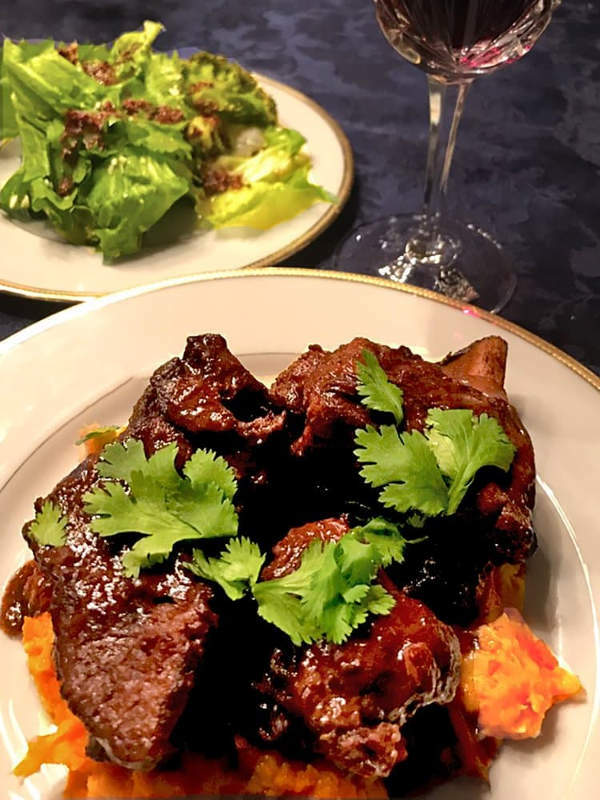 Since I love braised short ribs and use my Dutch oven for anything and everything, this recipe from Dan at Platter Talk is right up my alley. Five-spice is an interesting flavor for short ribs, and I like the color the carrot and parsnip puree adds to the dish. Due to the long cook time, all the work for this recipe is done in advance. Just imagine how the house will smell when your guests walk through the door. 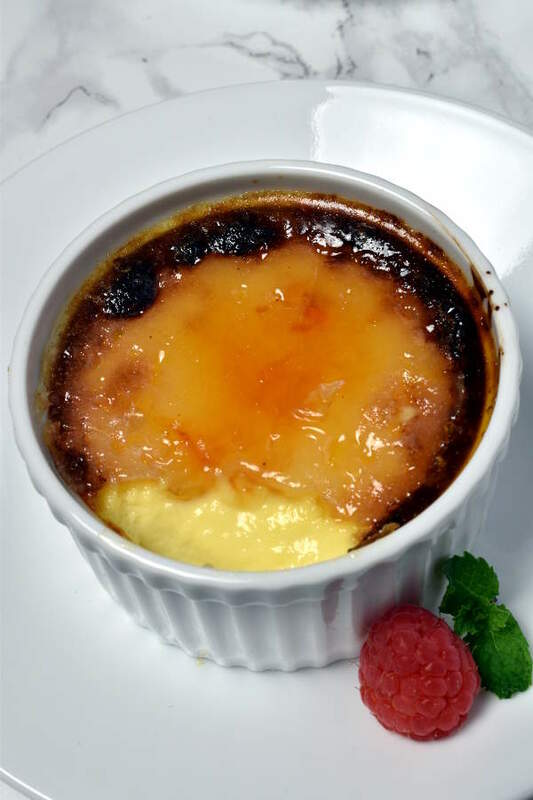 This recipe from Patty at Patty Saveurs can be made in advance and then baked right before serving. Chopped mushrooms keep the pork tenderloin from drying out and boost the dish’s flavor. And the port wine sauce sounds amazing. This travel-inspired recipe from Elizabeth and Mark at Compass & Fork will give your guests a taste of Morocco. 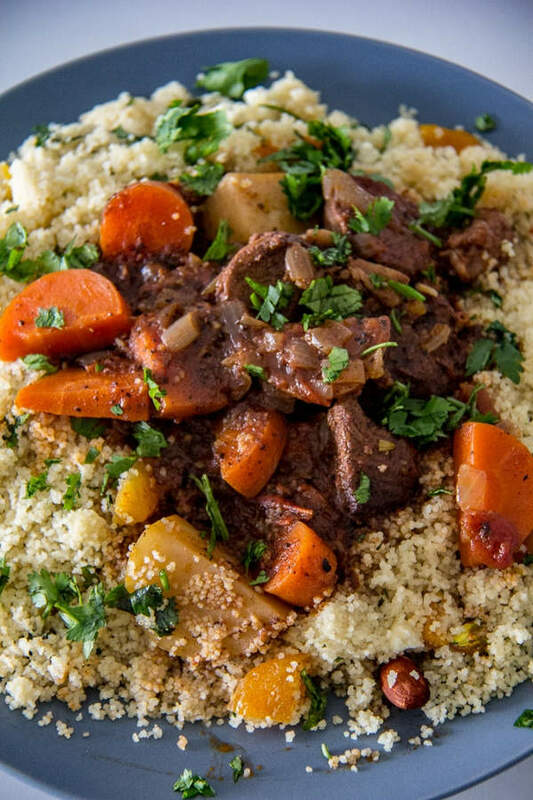 The slow-cooked lamb stew with couscous is perfect for serving a large group. I love the use of dried fruits, nuts, and fresh herbs in the couscous. I would serve with fresh mint tea. 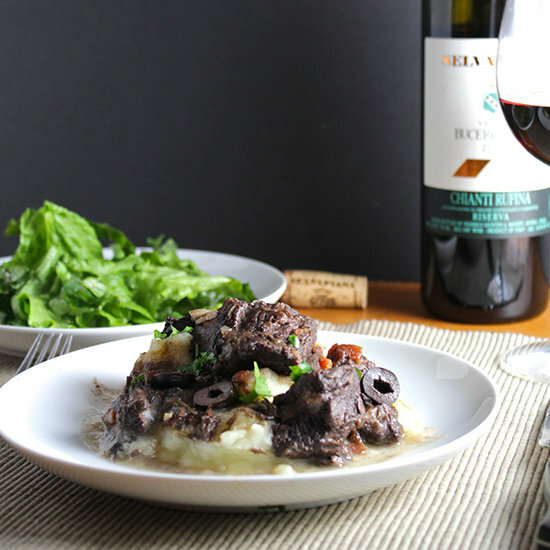 This beef stew recipe from David at Cooking Chat could be called the Italian answer to Beef Bourguignon. Stew is ideal for dinner parties because the work is all done in advance, and you can time it so your stew will be done simmering at your meal time. If you want to assign something to your guests to bring, I would check out David’s recommended wine pairings. This recipe from Renee at Renee Nicole’s Kitchen uses frozen blackberries, so you can make it year-round. I love the color blackberries bring to the dish. I would make the blackberry applesauce in advance and reheat, and I’d cook the pork chops right before serving. 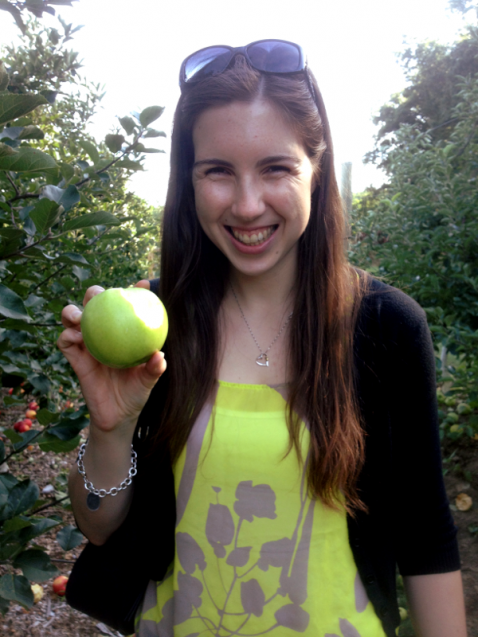 Renee has some great side dish suggestions in her post. 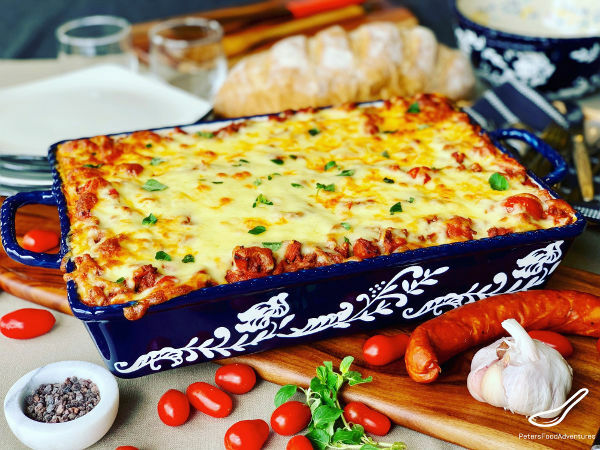 This lasagna recipe from Peter at Peter’s Food Adventures calls for three pounds of meat! This hearty cheesy baked pasta can feed a big group of meat-lovers. The spicy smoky flavor of chorizo adds that something extra to traditional lasagana. I would assemble in advance and bake just before dinner. Since my blog is not a vegetarian blog, I wanted to include vegetarian dinner party recipes with crossover appeal. Depending on the number of guests I’d be hosting and the mix of diets, I might make two main courses, one meat and one veg, so there’s something for everyone. With a smaller party, any of these veg recipes will be great for all tastes. This recipe from Natasha at Salt and Lavender can be made with canned or fresh tomatoes, depending on the season. 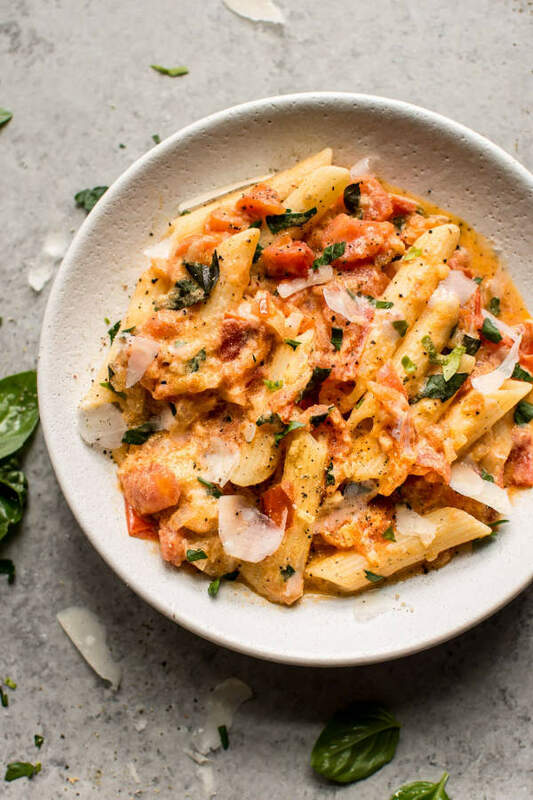 If I were making this for company, I might make the sauce in advance and then just boil pasta right before serving, but the recipe is quick enough that the make-ahead option isn’t really necessary. 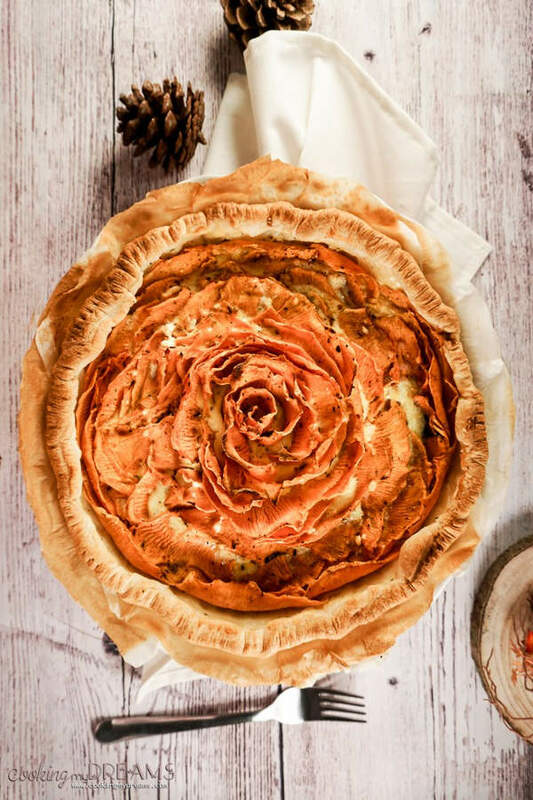 This beautiful quiche from Jessica at Cooking My Dreams can be made well in advance of your dinner party, and it uses pre-made puff pastry as the crust, so it’s easier than it looks. The vibrant orange color would look so pretty with a hearty green salad. Doesn’t it just sound fancier when the British call eggplant aubergine? 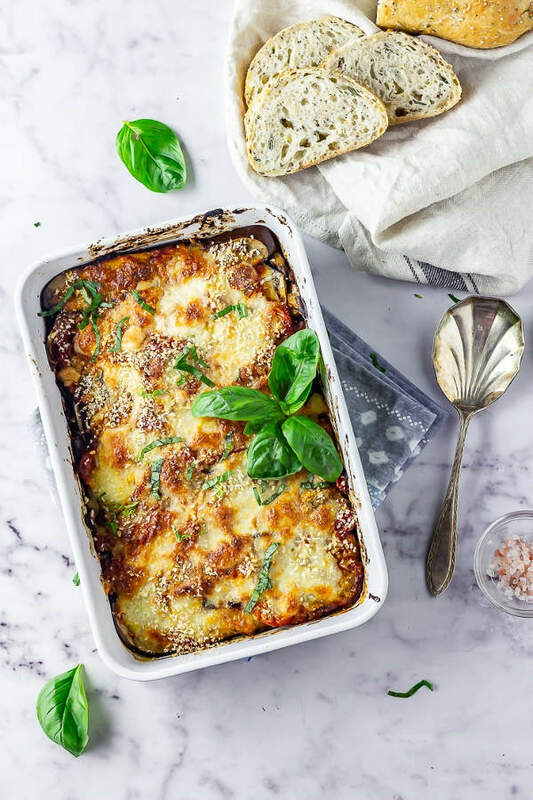 This aubergine aka eggplant parmesan recipe from Amy at The Cook Report is topped with crispy panko bread crumbs and can be fully made in advance. Just look at that browned melted cheese on top! Which of these dinner party recipes do you want to try first? Let me know in the comments. I know it’s a tough choice! Thanks Jessica! I had so much fun putting it together. Awesome post and oh so many delicious recipes ! 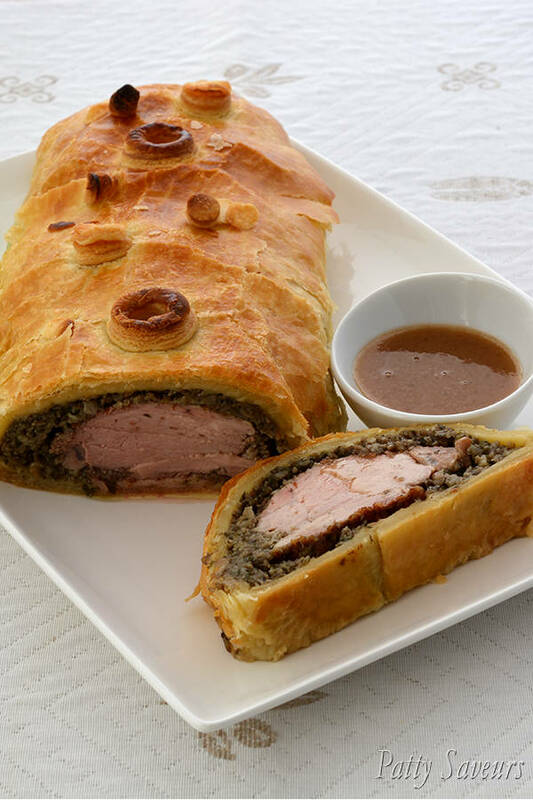 Thanks so much for including my Pork Wellington recipe Tara. What a fab round up Tara, thanks for including my Duck Confit with Roasted Rhubarb. 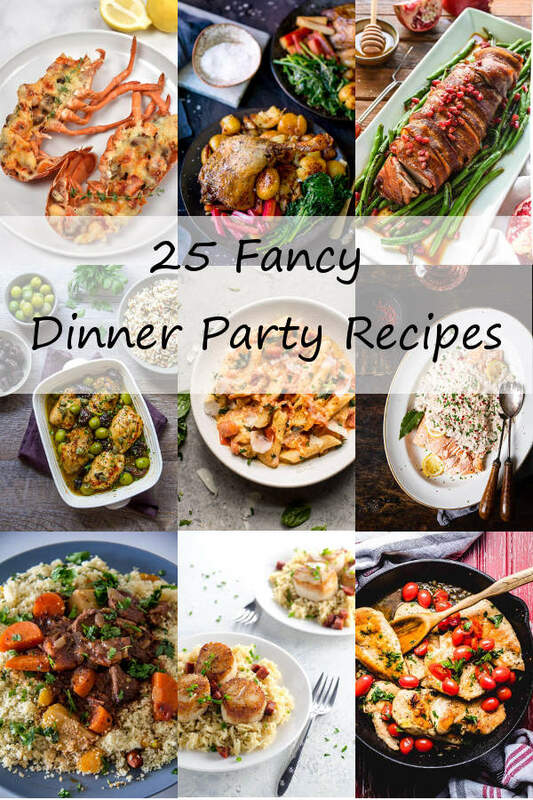 We are having a dinner party on Saturday night — I have no idea which of these delectable recipes to try first… Gonna have to plan 24 more get togethers… So many choices! I know! I think I’ll make some for dinner just for the two of us, so I get to try them all!